*sigh* Nerves. I'm presenting at this conference in an hour! Immediately after that I try to make my flight. Silly airplanes - ! United is routing me through CHICAGO on my way to Atlanta. Yep -- San Antonio, CHICAGO, Atlanta. Grr. I'll be home by 2 AM...if I'm lucky. To calm my pre-presentation nerves I decided to dress up in MichaMi's adorable little business frock. I saw the advert and was immediately drawn to a few cute details -- the ruched armwarmers, the natural-waist belt, the corset beneath the jacket. The jacket and corset come on many layers, and the prim skirt makes me look curvy but not overly exagerated. Go prim skirt go! I'm wearing it with Cordovan boots from Five Minutes After -- same vaguely purple-hued grey-black, if you can believe it. Rare color to match, eh? I'm also wearing it with a Redgrave skin, which makes me feel like a real teacher. The fluffy-hatted hair is from Shop Seu, and I had to pause to remember whether or not it's still being sold in-world. I have a guilty suspicion it was a hunt gift of some sort, and if so, I apologize -- I'll have my brain back on again if I ever get home. See you in Chicago for a few hours! Hopefully life's back to normal tomorrow...Now off I go to present on Second Life machinima and teaching Shakespeare! I'll be spamming flickr, no doubt. Bah, off I go. Bye bye guys! Good thing I got the new ~silentsparrow~ lucky chair outfit, eh? I needed conference wear! See y'all Saturday (or sooner if I can find internets in San Antonio. Surely they have them). I've never felt so much like a party crasher at the kool kid's cocktail fête as I did on plurk today. Plurk feels like a strange Instant Messenger cocktail party where popular people have a small flock of chatters around them, and the quiet people hide in the corner. I'm a corner-hider myself, so while it's fascinating, I think I'm way too shy for that venue of expression. I'm not sure why it's different with blogging. Perhaps it's because people read this by choice, whereas if I blather something stupid in plurk, they're forced to have it on their timelines! I'm flying to San Antonio tomorrow for a conference, and for some strange reason a few pals and I are chatting about the height and weight restrictions placed upon flight attendants. Did you know that there's a rule that requires proportionality? ...It strikes me that SL characters are shoe-ins for flight attendant positions. I'm gonna fly to San Antonio tomorrow to present about machinima at a teacher conference. Everyone wish me luck! I'll be back Saturday. ***Outfit: Harajuku Crimson by Blue Blood. Comes with 17 pieces, including shoes, legwarmers, armwarmers, a hat and a scarf. I love this coat. It's so well-constructed and cute that I...almost didn't want to write about it, hehe. In the interest of sharing, it's **DP**yumyum's new A Line Coat in yellow, and it can be found at the newly-snowy sim of iTuTu (credits below). Ellantha and I hung out there yesterday, and Ellantha said that she loves it when sims change with the season. I quite agree -- the second-hand chill that I get from playing in virtual cold is nice sometimes. 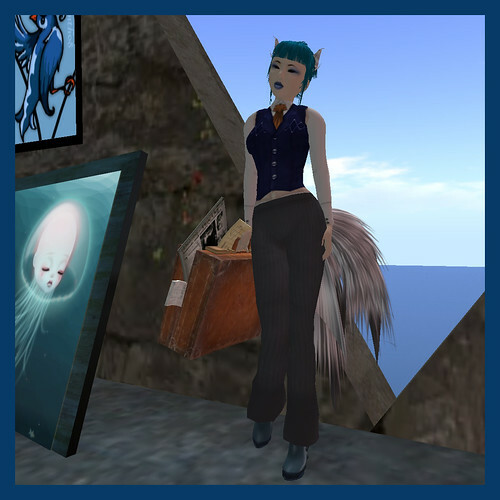 While wandering iTuTu, I stumbled into Den-Dou and was reminded that Den-Dou skins really suit my avatar. The eyes are always cutely blended for that slept-in-my-mascara look. I also like the playfulness of the Neko skins. What's my avatar been up to in these, I wonder? Bet she was trying to steal another Neko's cheese. Fair warning, I can no longer find the store that made my hat - ! Does anyone know what happened to Lapin et Anato? I miss it, it was an adorable shop. ***Hat: Lapin et Anato Horn Pig Hat -- wait, where'd it go? Anybody know? I don't know, Mr. Frost, the gold of Autumn is pretty lovely too: sunflowers bursting with seeds, early dusk, the scattering of leaves on my car. Whew. There's a lot to talk about. 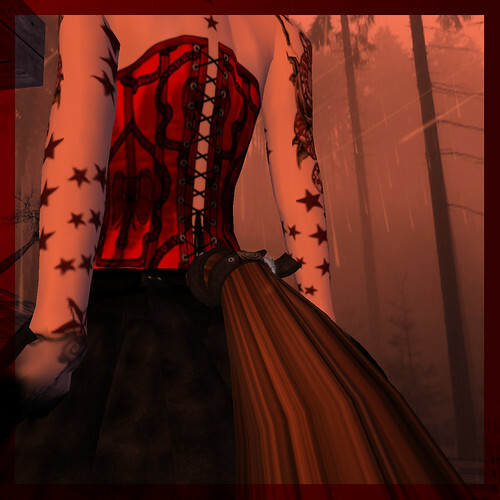 First, the ~silentsparrow~ new release in honor of 3,000 group members, the Suzume frock. It comes in four colors -- Ashia Tomsen is in the Dove color here, looking bloody gorgeous -- and we are in the original color (Sakuradawn) and Raven (moi). Sakuradawn is wearing the other new releases that match the outfit, Calico Ingmann Creations' Suzume hair in sea, and Fleur's Allure China Suzume 3 skin. She looks like she's stepped from the cover of a novel of high fantasy, all serene and elegant. I'm once again the sneaky elf companion, but this time I'm a night elf. 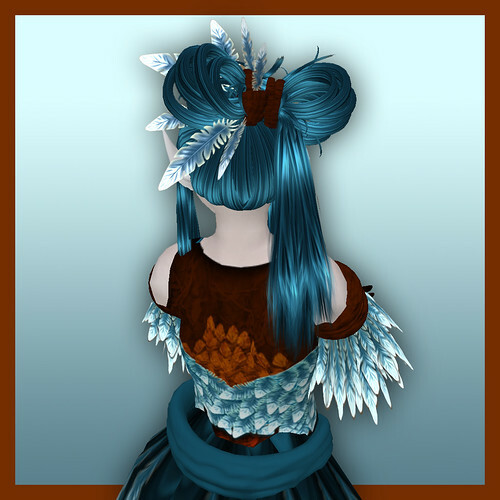 Schadenfreude released the Sennyo skin and ears to match the Suzume outfit, and they cast it in an entirely different light. 'tis evil in the Wild to fare. ***Necklace: Balderdash Faery Hoard Charmed I'm Sure.